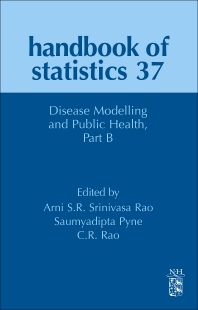 Handbook of Statistics: Disease Modelling and Public Health, Part B, Volume 37 addresses new challenges in existing and emerging diseases. As a two part volume, this title covers an extensive range of techniques in the field, with this book including chapters on Reaction diffusion equations and their application on bacterial communication, Spike and slab methods in disease modeling, Mathematical modeling of mass screening and parameter estimation, Individual-based and agent-based models for infectious disease transmission and evolution: an overview, and a section on Visual Clustering of Static and Dynamic High Dimensional Data. This volume covers the lack of availability of complete data relating to disease symptoms and disease epidemiology, one of the biggest challenges facing vaccine developers, public health planners, epidemiologists and health sector researchers. Division of Epidemiology, Department of Mathematics, Department of Medicine-Division of Infectious Diseases, Medical College of Georgia, Augusta University Laboratory for Theory and Mathematical Modeling, Medical College of Georgia Previously, Dr. Rao conducted research and/or taught at Indian Statistical Institute (1998-2002, 2006-2012), Mathematical Institute, University of Oxford (2003, 2005-07), Indian Institute of Science (2002-04), University of Guelph (2004-06). Until 2012, Dr. Rao held a permanent faculty position at the Indian Statistical Institute. he has won the Heiwa-Nakajima Award (Japan) and Fast Track Young Scientists Fellowship in Mathematical Sciences (DST, New Delhi). Dr. Rao also proved a major theorem in stationary population models and chicken walk models on grid graphs. He was employed at the Indian Statistical Institute (ISI) in 1943 as a research scholar after obtaining an MA degree in mathematics with a first class and first rank from Andhra University in1941 and MA degree in statistics from Calcutta University in 1943 with a first class, first rank, gold medal and record marks which remain unbroken during the last 73 years. “At the age of 28 he was made a full professor at ISI in recognition of his creativity.” While at ISI, Rao went to Cambridge University (CU) in 1946 on an invitation to work on an anthropometric project using the methodology developed at ISI. Rao worked in the museum of archeology and anthropology in Duckworth laboratory of CU during 1946-1948 as a paid visiting scholar. The results were reported in the book “Ancient Inhabitants of Jebel Moya” published by the Cambridge Press under the joint authorship of Rao and two anthropologists. On the basis of work done at CU during the two year period, 1946-1948, Rao earned a Ph.D. degree and a few years later Sc.D. degree of CU and the rare honor of life fellowship of Kings College, Cambridge. He retired from ISI in 1980 at the mandatory age of 60 after working for 40 years during which period he developed ISI as an international center for statistical education and research. He also took an active part in establishing state statistical bureaus to collect local statistics and transmitting them to Central Statistical Organization in New Delhi. Rao played a pivitol role in launching undergraduate and postgraduate courses at ISI. He is the author of 475 research publications and several breakthrough papers contributing to statistical theory and methodology for applications to problems in all areas of human endeavor. There are a number of classical statistical terms named after him, the most popular of which are Cramer-Rao inequality, Rao-Blackwellization, Rao’s Orthogonal arrays used in quality control, Rao’s score test, Rao’s Quadratic Entropy used in ecological work, Rao’s metric and distance which are incorporated in most statistical books. He is the author of 10 books, of which two important books are, Linear Statistical Inference which is translated into German, Russian, Czec, Polish and Japanese languages,and Statistics and Truth which is translated into, French, German, Japanese, Mainland Chinese, Taiwan Chinese, Turkish and Korean languages. He directed the research work of 50 students for the Ph.D. degrees who in turn produced 500 Ph.D.’s. Rao received 38 hon. Doctorate degree from universities in 19 countries spanning 6 continents. He received the highest awards in statistics in USA,UK and India: National Medal of Science awarded by the president of USA, Indian National Medal of Science awarded by the Prime Minister of India and the Guy Medal in Gold awarded by the Royal Statistical Society, UK. Rao was a recipient of the first batch of Bhatnagar awards in 1959 for mathematical sciences and and numerous medals in India and abroad from Science Academies. He is a Fellow of Royal Society (FRS),UK, and member of National Academy of Sciences, USA, Lithuania and Europe. In his honor a research Institute named as CRRAO ADVANCED INSTITUTE OF MATHEMATICS, STATISTICS AND COMPUTER SCIENCE was established in the campus of Hyderabad University.